Local epidemics of corn tar spot have growers worried in Indiana about how their corn will finish out the season. The tar spot pathogen, Phyllachora maydis, was first identified in the United States in 2015 in Illinois and Indiana. Currently we do not understand the biology or epidemiology of this disease. There is very limited and incomplete information about this disease from its native region of Latin America. We are collaborating with the Kleczewski Lab (Univ. of Illinois), Smith Lab (Univ. Wisconsin) and others in the North Central region to determine the distribution of tar spot and gather any information we can about hybrid susceptibility or other environmental observations. Likely overwinters – crop residue? Weeds or other plants? What to look for: Small, black, raised spots (circular or oval) develop on infected plants, and may appear on one or both sides of the leaves, leaf sheaths, and husks. Spots may be found on both healthy (green) and dying (brown) tissue. Often, the black spots are surrounded by a tan or brown halo; this is especially obvious on healthy leaves (see images). The map shows current distribution in India – 2018 counties are in red. Wanted: We need samples of corn infected with tar spot, especially in counties where is has not been reported. 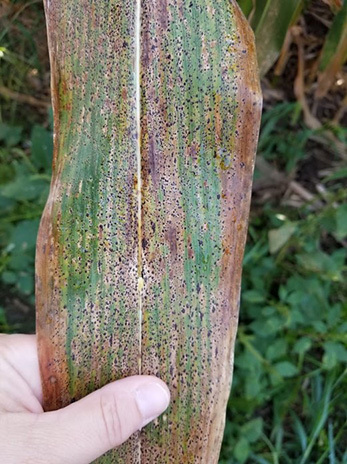 If you have (or think you have) corn tar spot, please collect several leaves showing the symptoms and send them with a PPDL form https://ag.purdue.edu/btny/ppdl/Documents/Forms/PPDL-Form_13MAY15FILLABLE.pdf. There will be no charge for corn tar spot samples since they are needed for research. Please wrap the leaves in newspaper and ship in a large envelope. Please ship early in the week. 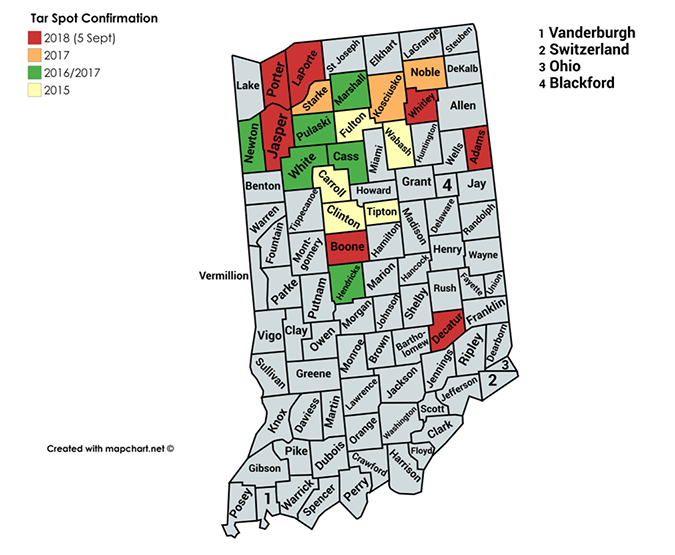 If you are sending samples from multiple locations please label them and provide the date collected, variety of corn, field zip code or county, and previous crop. We have many questions about why this disease has become such an issue. Why is it so bad this season? What changed? We will keep you updated as we learn more, so stay tuned.